We were returning from dinner along river, and I couldn't resist this distance sight--of the spot which provides Bernard Berenson's favorite view of Florence (which I was thinking of after yesterday's visit to his nearby villa). 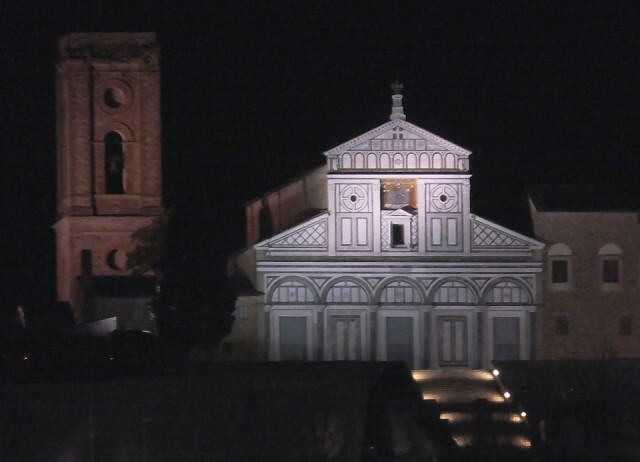 In full it's San Miniato al Monte. Today was otherwise devoted to the Uffizi (still surely the world's most frustrating great museum), Santa Maria Novella (also virtually a museum, but manageable), and Santa Trinitá (easily overlooked, but also with wonderful things).